Kerry Hubbard, Membership Chair checks members and guests in for our January 15th meeting. 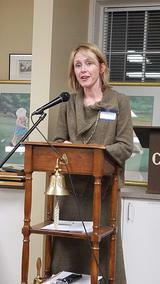 Debra Wallin, President welcomed members and guests and thanked the board for their service. She also explained the board is looking for volunteers to help with young author events, socials, and help with our 2022 100 year anniversary celebration. As the Membership Engagement activity, we looked for members that have been in the club the longest. Dede Wilson, Irene Honeycutt, and Margaret Bigger were all honored for over 20 or 30 years of membership. Other members that have been long time members were not in attendance. Kathie Collins, Program Chair introduces our speaker, Dede Wilson. Charlotte poet Dede Wilson would probably tell you she's really a newspaper gal. Her first job after college was obit editor for her hometown paper, the Alexandria (LA) Daily Town Talk. One year later, she relocated to Dallas, Texas, where she became travel editor of the Dallas Times Herald. In 1967, she moved to Charlotte where she soon joined the Charlotte Writers' Club, becoming president 30 years later. The club later honored her with the Adelia Kimball Founders Award. Dede's seventh book of poetry is forthcoming. Her first book, Glass, was published by Scots Plaid Press as runner-up for the 1998 Persephone Press Award, and her second book, Sea of Small Fears, won the 2001 Main Street Rag Chapbook Competition. Eliza: The New Orleans Years was produced as a one-woman show in Mississippi and North Carolina. Her poems have appeared in numerous journals including Spoon River, Carolina Quarterly, Painted Bride Quarterly, Southern Poetry Review, Flyway, Tar River, South Carolina Review, Atlanta Review and Tampa Review. Dede Wilson takes us through the history of the Charlotte Writers' Club, starting with our founder Adelia Kimball who moved to Charlotte in 1920 from Lowell, Massachusetts. 1920 - WWI was over, 1918 flu epidemic ended, women could vote, and no longer wore girdles. She lived in the Addison apartments on Morehead, which are still there. She was homesick for writers so taught 10 writing classes the spring of 1922. She said, 'all we do, or want to do, is write, and discuss our own writing'. Classes merged into Writers' Club and they met at Carnegie Library on Tryon Street. Dede shared her notes from her talk with us which you can see by clicking on the NOTES link. *1962-64 - Helen Copeland * authored number of books, poetry, the children's book Meet Miki Tikino, a memoir. October 24th, a movie made from her book "Duncan's World" which played Park Terrace and Tryon Mall theaters. *1987-1988 - Tony Abbott * (with future president Brenda Wensil got a grant from the Arts and Science Council to host NCWN conference in Charlotte, chaired conference), spearheaded 3rd Writers' conference at Queens, has taught workshops and been a speaker many times, once spoke on Starting a Writing Career in Middle Age and his catchword was BOOM Becoming one's own man!!! *1996-98 - Dede Wilson * wear what you love and never get to wear party!!! Margaret. Biggers wore her Cheerleading Uniform! -Dede wrote an article about the club's history for the 75th ANNIVERSARY! *2003-2005 - Lisa Kline - 10 books for young people - can even drive a forklift!